The Sailor's Farewell, Henry Hudson, 5 November 1785, National Maritime Museum. The familiar trope of the sailor's farewell is illustrated here once again. 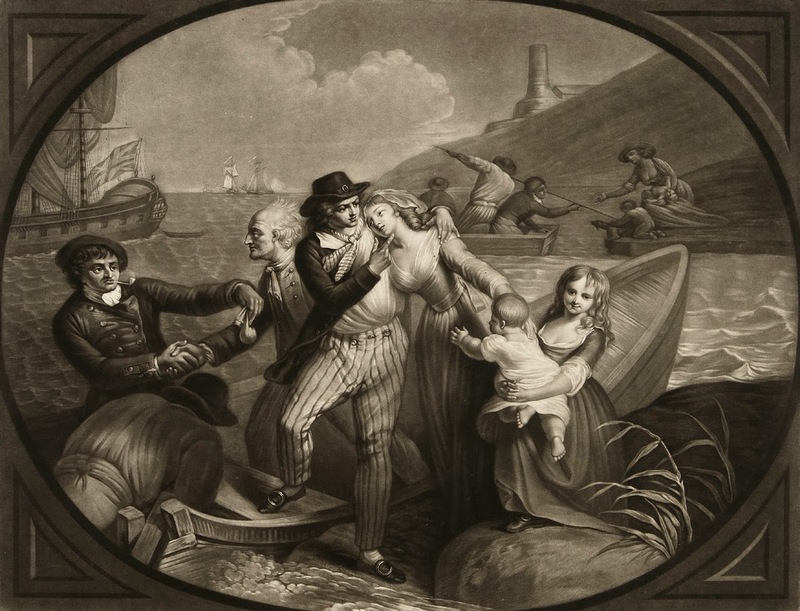 This piece is notable for being one of the few to portray a sailor as a fatherly figure, not unlike a Rowlandson piece I've examined here before. The sailor in the center wears a round hat with the brim turned up slightly on each side, and a small metal buckle at the center. His hair is longer than most sailors, though still shorter than most other professions of the time, and hangs loose. The neckcloth is striped and he wears no waistcoat. An unlined jacket is hanging open over his white shirt, and appears to be single breasted with turned back cuffs, rather than the familiar slash cuffs, as on the tar to the left. His striped trousers have a broad fall fly with three large buttons, though the actual material the buttons are made from is unclear. His white stockings, oval buckles, and black leather shoes are all familiar. Behind our main sailor is an elderly tar, taking the hand of another jack. The old sailor wears a jacket with wide lapels and domed buttons, as well as a white neckcloth and white trousers. 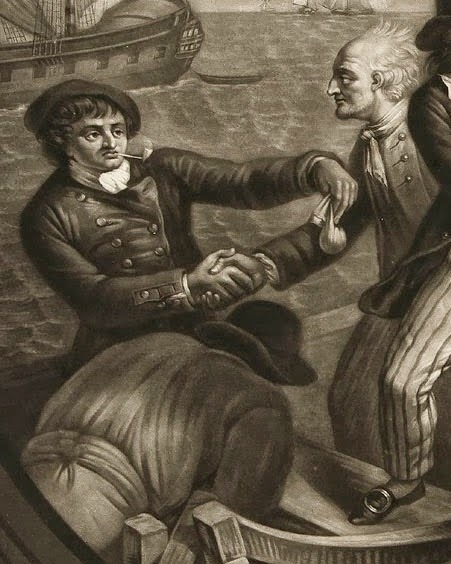 Taking his hand is a younger seaman who offers a purse with his opposite hand. His is a round hat set well back on his head, and like his counterpart he wears a white neckcloth. He wears a double breasted jacket and unbuttoned slash cuffs. Leaning over the rail into the boat is a fellow with a round hat, white shirt, and white trousers, breeches, or slops. In the right background is another sailor bidding farewell to his family. He wears a cap or some sort (possibly a thrum cap), a short jacket that ends at his waist, and either a pair of trousers or slops. The oarsman pushing them off the shore wears a white shirt, round hat and striped trousers.